JOHN PEARSON came to South Carolina from one of the English settlements of Virginia during colonial times. John had two sons, AARON and MOSES. MOSES PEARSON owned and lived upon what at one time was known as the big plantation but later came to be known as Lowdon. He was prominent in the affairs of the American Revolution as a lieutenant in Hicks Regiment in 1780 and during the subsequent two years as a captain in Bentons Regiment. After the war his name appeared frequently in the records of the old Brownsville church and in those of the county court. Moses was one of the first justices of Marlboro County and seems to have presided over the court. He was also involved in a similar capacity in the old Cheraw district before it was organized as a county. Moses is said to have fathered eight sons and seven daughters. One of the daughters became MRS.HASKEW (wife of John or Zacheus Haskew perhaps?). Another daughter became Mrs. Galloway. One of the sons was named Thomas and was the ancestor of the brothers Moses and Zacheus Pearson. Mrs. Joel Easterling, John D. Pearson and Mrs. Rachel Townsend were descended from another of Moses sons. The JOHN family is also said to be in some way connected to the Pearson family. good young people have sprung. A sister of these old men married a Mr. Britton, a son of whom, Hugh Britton, is remembered as one of the fine-looking young men of Brownsville society in the (eighteen) thirties." According to the Abstracts of Revolutionary War Pension Files John Haskew was a member of the South Carolina Line. This would have been a regular infantry unit. At the time of his enlistment he lived in an area of Craven County, S.C. which would later become Marlboro County. He still lived there when he applied for a pension on October 5th, 1832 at which time he was 69 years old. From this we can deduce that John was born between Oct. 6th 1762 and Oct. 5th 1763. Since he lived into his 80s his time of death must have been at some point from the mid 1840s to the early 1850s. Being that he was one of the old heroes of the Revolution perhaps an obituary or other notice could be found in South Carolina records. In 1820 John Haskew Senr (suggesting the existence of a John Jr.) was living in Marlboro County, S.C. and was over the age of 45. Living with him were a female (could be a wife or daughter) between the ages of 26 and 45 and two females (probably daughters) between the ages of 10 and 16. Living near John Haskew Senr in 1820 was MOSES J.HASKEW. Moses is listed as being between 26 and 45 years of age. Living with him was a wife (or daughter) aged 16 to 26 and four chidren, two sons and two daughters, all under the age of ten. (It is interesting to note the use of the name Zacheus by both the Pearson and Haskew families and the use of the name Moses by persons with the surnames Pearson, Haskew and Heskew/Hesskew. The pattern suggests much.) In 1830 a MOSES HASKEW (mistranscribed in the census index as Hasken) is living in Dallas County, Alabama and is between the ages of 50 and 60. Living with him is a wife age 50-60, a daughter age 20-30, a daughter age 15-20, and a daughter age 10-15. Also living with him are a son age 20-30, a son age 15-20, and a son age 10-15. I believe that the two older sons are MOSES HESSKEW and WILLIAM ALEXANDER HESSKEW who later during the 1830s would move on to Texas. In 1840 in Dallas County, Alabama there was a M. HASKIN; a male age 60-70. I believe this is the same person as the Moses Haskew of 1830 mentioned above. Living with M. Haskin in 1840 were a wife age 60-70 and a daughter age 20-30. There are also a Joel E. Haskins and a P.E. Haskins living in the same county as M. Haskin, but I have no evidence to suggest that they are connected. According to Dallas County, Alabama Geneological Records, Volume 1, page 27, in 1845 the will of MOSES HESKEW was executed. The witnesses were Henry Averyt and Wm. W. Olds. I do not yet have a copy of this will but firmly believe that this is the same man that I have been following decade by decade and that he is the father of MOSES HESSKEW and WILLIAM ALEXANDER HESSKEW. There was also a MOSES HASKEN (probably a mistranscription of Haskew) who married NANCY JOHN in 1812 in Marlborough (sic) City, South Carolina. During the War of 1812 he was a private in Captain Betheas Company of South Carolina Militia. According to an index of War of 1812 pensioners he died in 1828 but his wife Nancy was living in Marlborough (sic) city of Marlborough (sic) District, S.C. from 1855 to 1871. This Moses is obviously one of the South Carolina Haskew family. 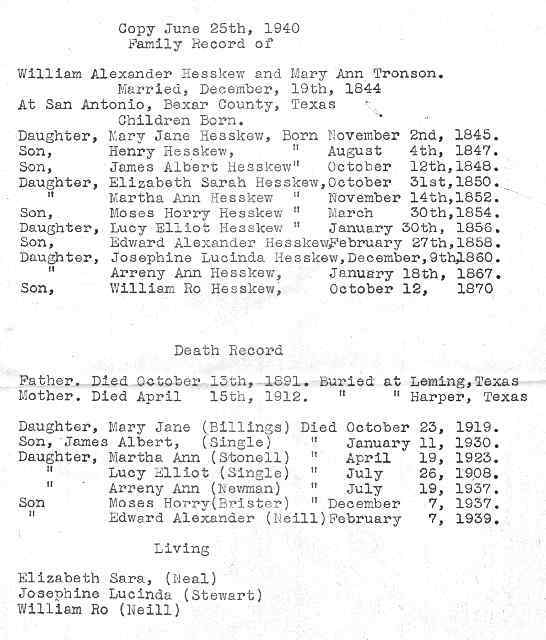 But is he the one in the 1820 census and if so how, if indeed is the Moses Haskew of 1830 Alabama connected? Since Moses was a commonly used name in this particular family more research is needed in order to avoid confusion. 7) unknown page.. but a survey done for Thomas A. CORGILL of his 189 acres, the SW part of a tract granted to William Henry MILLS by SC governor William BULL 10 FEB 1775 of 405 acres. Re-surveyed 24th JAN 1809. Zacheus HASKEWs land a border. Aaron PEARSON Sr. of Marlborough District to John HASKEW Sr.
79 acres of land being part of a parcel of 150 acres which isa part of a parcel of 405 acres granted to William Henry MILLS by his excelleney William BULL Esqr 10 FEB 1775 on the East side of Peedee River and Durby Bay and conveyed by said William Henry MILLS to Aaron PEARSON by lease & release 17th & 18th NOV 1775 and from Aaron PEARSON to Magnus CORGILL by lease & release bearing date 17th & 18th JULY 1778 and from Magnus CORGILL unto Peter WAY by deed 29th Sep 1802 and from Peter WAY to Thomas A. CORGILL by deed 14th MAR 1807 the 79 acres is the in the SW part of the 150 acres and is the balance that remains of the said tract that was surveyed by Philip PLEDGES 24th JAN 1809 refers to platte by Philip PLEDGES. Imprimis I give and bequeath to Ruth, my dear beloving wife her life on my land to live pesibly (sic) on the same during her life and likewise my household goods and movables to my wife during her lifetime, and likewise my stock of cattle and hogs and horses to her fbr the support of my beloved sons and daughters, and at the decease of my beloved wife I give and bequeath unto my loving sons named John ASKEW and Jesse my land equally divided between them, and all my said movables and stock of all sorts to be likewise divided amongst all my loveing (sic) children in like manners. Aaron PEARSON being duly sworn maketh oath that he was present & saw John ASKEW the Testator named in the within instrument of writing sign seal & execute the same as his last will and Testament the said John ASKEW being then of sound mind, memory and understandings, that the name Aaron PEARSON subscribed as a witness to the execution of the said will is the deponent's hand writing & that Manuel COX & Moses PEARSON were also present at and witnesses to the execution thereto together with the deponent subscribed their names as such in the presence of each other. I do not find that the above will was ever before recorded"